Visit Adelaide Oval and Smith Brothers Walking Trail for their historical value. 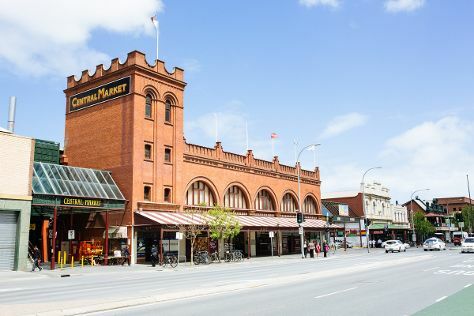 Do your shopping at Rundle Mall and Unique Opal Mine Pty Ltd. Get out of town with these interesting Adelaide side-trips: McLaren Vale (Fox Creek Wines, McLaren Vale III Associates, & more), Seppeltsfield (in Seppeltsfield) and Tanunda (Rockford Winery, Langmeil Winery, & more). There's much more to do: hunt for treasures at Adelaide Central Market, admire the natural beauty at Adelaide Botanic Garden, tour the pleasant surroundings at Adelaide Zoo, and admire the masterpieces at Art Gallery of South Australia. To see ratings, where to stay, traveler tips, and tourist information, you can read our Adelaide trip planner . February in Adelaide sees daily highs of 32°C and lows of 19°C at night. Wrap up your sightseeing on the 25th (Mon) to allow time to travel back home.